This is a high power 1000W front wheel kit that uses the highest capacity/longest range 48V battery that mounts within the frame of the bicycle. It delivers power, speed and range to the highest ability of all kits available and with the new Tiger Shark mould the handling is greater than having a rack mounted battery. This kit can only be used with rigid front forks. If you have suspension or carbon forks then you should use a rear wheel powered kit. 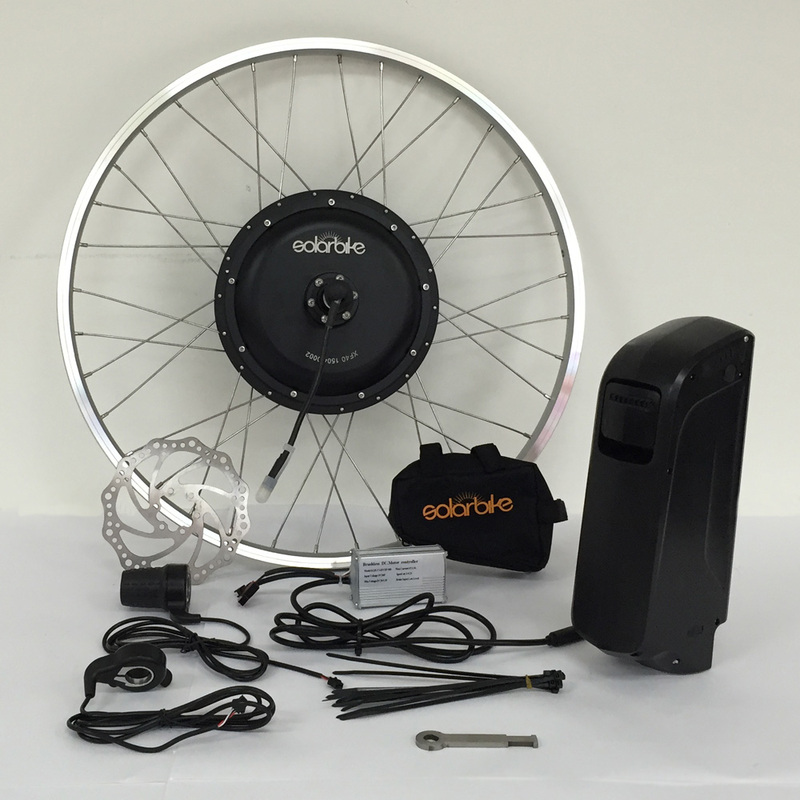 This kit includes a PANASONIC 48V 17.5Ah tiger shark battery, 48V lithium ion battery charger, motor laced into ALEX DH18 rim with stainless steel spokes, motor, controller, twist grip throttle, thumb grip throttle, torque bar, cable ties, disc, inner tube and instruction manual. All kits are disc compatible. 200W is the legal limit for riding on the road. Battery: 48V 17.5Ah PANASONIC Tiger Shark Battery. Click here for specifications. Range and Speed: 42km/h. Range approximately 37km with light pedalling. Information: Kit includes PANASONIC 48V 17.5Ah tiger shark battery, 48V lithium ion battery charger, motor laced into ALEX DH18 rim with stainless steel spokes, motor, controller, twist grip throttle, thumb grip throttle, torque bar, cable ties, disc, inner tube and instruction manual. All kits are disc compatible. 200W is the legal limit for riding on the road.